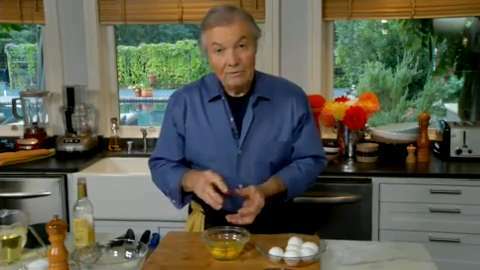 Jacques Pépin properly separates eggs. When you use eggs, a common mistake you know is to [SOUND] break the egg on something pointed like this. What that does, it goes inside and triggers bacteria from the shell into the eggs and often break the yolk. [SOUND] So what I do, I always break it [SOUND] on something flat like this. [SOUND] Now this is the way I like to separate the eggs. I put them all of that rather than going from one share to the other. I find out that there is already a quarter of the egg white which has stuck around the yolk or in the shell. When you beat an egg white properly, you get one cup of egg white for a large egg. If you miss a quarter in each eggs, Your proportion also, I cut them this way then grab the yolk out. You can see here, that yolk I do it from one hand to the other and that will then include trying to separate what I have here which [INAUDIBLE] of the egg. It's on the wet side and also on the other side. You know sometime it's longer, the [UNKNOWN] of the egg is actually a [UNKNOWN] which holds that yolk in suspension in the center of the shell. It has nothing to do with like the germ of the eggs or anything like this. You can freeze your egg white easily. And each egg white will fit in one of those Ice cube container, you know, the large one. So it's an easy way, when they are frozen you put them in a bag. The egg yolk don't freeze well. You have to go to a lower temperature because of the bacteria.